Cordova at Spanish Wells is an active lifestyle community in Bonita Springs, Florida. This gated enclave within the master-planned community of Spanish Wells Golf & Country Club offers homeowners a luxurious lifestyle and world-class amenities. With just 128 single-family homes sprawled across 54 acres of lush landscaping, homeowners can get to know their neighbors and build lifelong friendships. Many of the homes within Cordova at Spanish Wells feature elegant designs that are located on pristine lakefront or natural preserve homesites. The community's premier Southwest Florida location also allows residents to have easy access to everything they could want or need, including major roadways, retail stores, restaurants, Gulf beaches, cultural attractions, and entertainment. Although the Cordova section doesn't have its own clubhouse, residents of this neighborhood enjoy a social membership to the master-planned Spanish Wells Golf & Country Club. The 32,000 square-foot clubhouse provides all of the resort-style amenities one would need for a vibrant lifestyle. Indoor amenities include a state-of-the-art fitness center, restaurant, library, billiards table, business center, and multi-purpose room that's perfect for gathering with friends. A golf pro shop is also located within the clubhouse to help residents set up tee times, reserve lessons with a golf pro, or stock up the latest golfing gear. The amenities continue outdoors with a sparkling resort-style pool and patio, which are ideal spots to relax or sunbathe while enjoying Florida's tropical climate. Adjacent to the pool and patio is the cabana where residents can cool off while having a refreshing drink or light lunch. Neighbors can challenge each other to a friendly game on the tennis or bocce ball courts any day of the week. The focal point of the community's amenities is the 27-hole championship golf course. Homeowners can play in three different 18-hole combinations that include diverse course layouts, water features, and a tropical landscaping. Practice facilities are also onsite and include an aqua driving range, pitching and chipping area, and two large putting greens. In addition to these lavish amenities, active adults can also utilize the beach shuttle, which is a 46-passenger pontoon boat that takes residents to the pristine beaches at Delnor-Wiggins Pass State Park. Construction of Cordova at Spanish Wells began in 2014 and will consist of 128 single-family homes upon completion. Homes have lake or golf course views and can be built as either one-story or two-story residences. They include elegant master suites on the main level and range in size from 1,775 to 2,950 square feet. Single-family homes have two to six bedrooms, two to four bathrooms, and attached two or three-car garages. Some features include high ceilings, granite countertops, stainless steel appliances, tile roofs, designer kitchens, luxury fixtures, energy-efficient materials, and low-maintenance exteriors. Active adults of Cordova at Spanish Wells have endless options for socialization and recreation. They can mingle with other neighbors within the Cordova section residents or join one of the many clubs, activities, or events held at the clubhouse. Spanish Wells Golf & Country Club hosts annual functions like BBQ buffets, themed dinners, cocktail receptions, holiday parties, tournaments, leagues, clinics, and pool parties. Residents can maintain their fitness regimen by joining a group fitness class or attending a personal training session. Golfers can practice their swing by taking lessons from the on-site golf pro. Neighbors can play cards or billiards for a fun game night or enjoy leisurely strolls along the walking and biking trails. Homeowners will never have a dull moment living in this active and exciting environment. 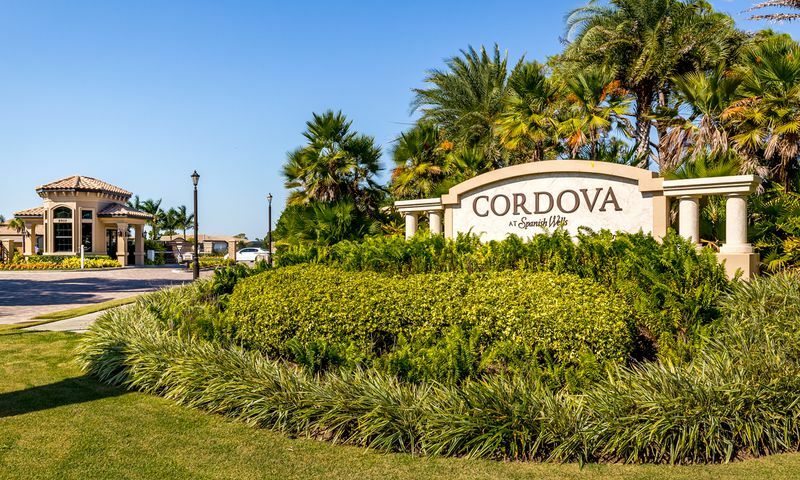 Cordova at Spanish Wells is located off of Old US Highway 41 in beautiful Bonita Springs, Florida. Residents are close to daily conveniences and attractions. Shopping options like Publix and Sweetbay as well as Coconut Point Mall, Miromar Outlets, and Gulf Coast Town Center are less than 20 minutes away. Some of the best medical facilities are located 20 minutes away from the community and include North Collier Hospital, Physicians Regional Medical Center, and Lee Memorial Hospital. Homeowners who want to enjoy the sun and sand are less than 15 minutes away from the scenic beaches along the Gulf Coast. Residents can also visit Naples 25 minutes away or Fort Myers about 35 minutes away for additional entertainment and attractions. When traveling farther is necessary, Southwest Florida International Airport just under 30 minutes away. Cordova at Spanish Wells is a luxurious community that not only offers great amenities and quality home designs but also provides a prime location within Southwest Florida. Residents of Cordova at Spanish Wells will have a social membership to enjoy the amenities found at Spanish Wells Golf &amp; Country Club. Clubhouse - 32,000 Sq. Ft. There are plenty of activities available in Cordova at Spanish Wells. Here is a sample of some of the clubs, activities and classes offered here. Construction of Cordova at Spanish Wells began in 2015 and will consist of 128 single-family homes upon completion. Homes enjoy lake or golf course views and can be built as either one-story or two-story residences. They include elegant master suites on the main level and range in size from 1,775 to 2,950 square feet. Single-family homes have two to six bedrooms, two to four bathrooms, and attached two or three-car garages. Some features include high ceilings, granite countertops, stainless steel appliances, tile roofs, designer kitchens, luxury fixtures, energy-efficient materials, and low-maintenance exteriors. Please Note: Floor plans are not available at this time. 55places.com is not affiliated with the developer(s) or homeowners association of Cordova at Spanish Wells. The information you submit is distributed to a 55places.com Partner Agent, who is a licensed real estate agent. The information regarding Cordova at Spanish Wells has not been verified or approved by the developer or homeowners association. Please verify all information prior to purchasing. 55places.com is not responsible for any errors regarding the information displayed on this website.